Glest Game Review - Download and Play Free Version! Excellent and free 3D real time strategy game! Glest is one of the best freeware strategy games out there. Set in medieval Europe with an extensive back storyline, the gameplay is challenging and plenty of fun! 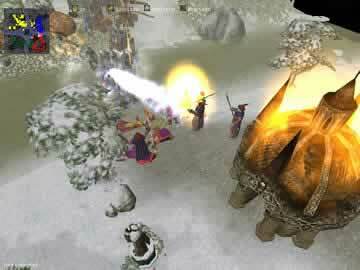 In fact, the quality of this free game will remind you of other great RTS games such as Rise of Legends, Age of Empires, and War Craft. The game offers you two factions to choose from: Tech, which is mainly warriors and mechanical devices, and Magic, with wizards and summoned creatures such as dragons. Regardless of which side you choose, you'll find plenty of action to keep you playing for hours! Glest puts you in control of building armies for one simple goal, annihilate the enemy. With two playable factions and a plethora of maps you will find plenty to do. Compete against up to three computer opponents in team combat or a free for all battle. The medieval setting and quality graphics make this a great game to play. If all of that doesn't get your attention this will, its free. This real time strategy (RTS) game puts you in control of one of two factions, the Magic or the Tech. Magic utilizes magic to summon hordes of undead soldiers as well as dragons and golems. Tech utilizes standard barracks to train troops as well as technicians who build massive robotic units to fight for you. There are also differences in gameplay for each faction. An example of this would be how each team supports their armies. Magic uses energy to summon troops while Tech must build and maintain farms to keep their armies going. Each team has unique buildings that will unlock upgrades and better units for battle. Both require a unique strategy to be victorious allowing you to play each team many times to perfect your skills. One of the two modes offered for play is the Scenario mode. These are preset maps that tell you the difficulty rating, the map and who you will be playing. The goal is always last man standing, but these allow you to face various enemies without having to set up a game. The other mode is custom game. Custom game lets you choose all the options. You can select things like your faction, which map and how many opponents you will face. Custom mode also allows you to assign teams. The one thing you can't adjust is the difficulty setting of the computer opponents. The computer opponents are quite challenging but if you have some RTS experience you will be able to quickly pick up the gameplay. There is also the option of multiplayer with a LAN connection. The graphics are nothing spectacular, but are on par with the average RTS game. The game does a good job of setting up the medieval theme in the art and sound. All the buildings look authentic. Another plus to the graphics is that everything is easily distinguishable from others. You will never confuse one troop for another. The game even goes as far as adding a day and night aspect. As you are playing it will cycle through days and get dark at night. At night it can be difficult to see anything because it is so dark. There are a few drawbacks to this game that might limit its audience. First there are no difficulty settings. You can adjust how many opponents you are facing, but the individual difficulties cannot be adjusted. This might scare away people who don't have much RTS experience. Another drawback is the lack of a campaign mode. This game doesn't have a story to accompany it, it only offers straight last man standing elimination style play. Glest is mostly geared towards players who have some experience playing RTS games, but if you are patient and don't mind losing a lot of rounds before you can get the hang of it, this is definitely worth a try. The medieval setting makes battles interesting with dragons shooting mechanical ground units. Even though there is no campaign, there are plenty of maps, scenarios and two factions to play them all with. With this game being free it is absolutely worth the download. 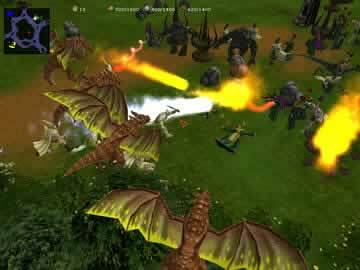 Check out this massive battle captured from Glest!